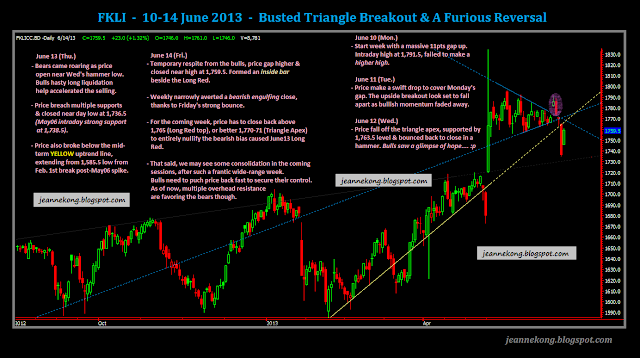 Analyzed all four of my majorly traded futures contracts in this end-week post. Meanwhile, gotta travel to JB for a wedding dinner tomorrow night. Hopefully, FKLI do not give me much trouble on Monday coz I may not be able to monitor it then. 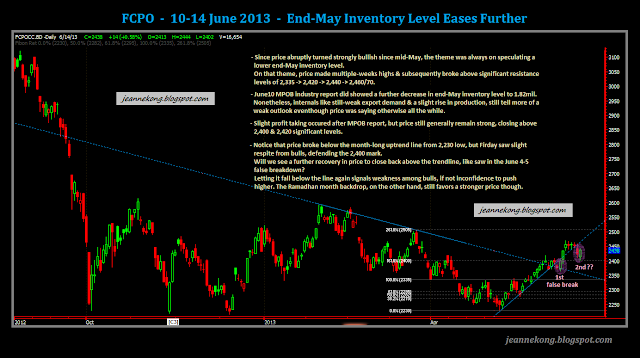 Expecting some consolidation ahead, but still 'hopeful' for slightly more upside from Friday's close of 1,759.5. CPO, on the other hand, made a 2nd breakdown from its uptrend line extending from significant 2,230 low since May. A second false alarm in a row?....I'll say very unlikely. Technicals currently agrees with me, too. However, with the Ramadhan month round the corner, & a lower end-May inventory level as expected, the big picture still favors the bulls, at least for the moment. 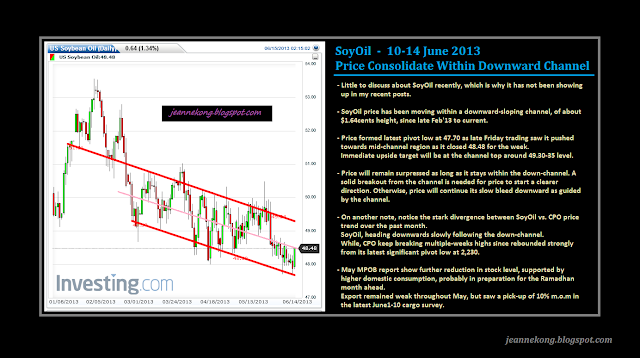 SoyOil was on an entirely different downward route from CPO, which is why I wasn't even posting on its outlook recently. 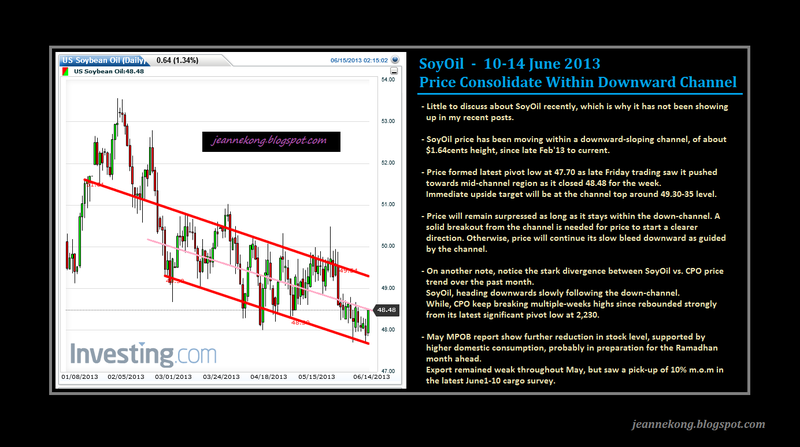 Oversupply is also a headache for SoyOil price currently, just like many other major soft commodities. Price is generally downward trending, as long as it stays within the down-channel holding it since late Feb'13. 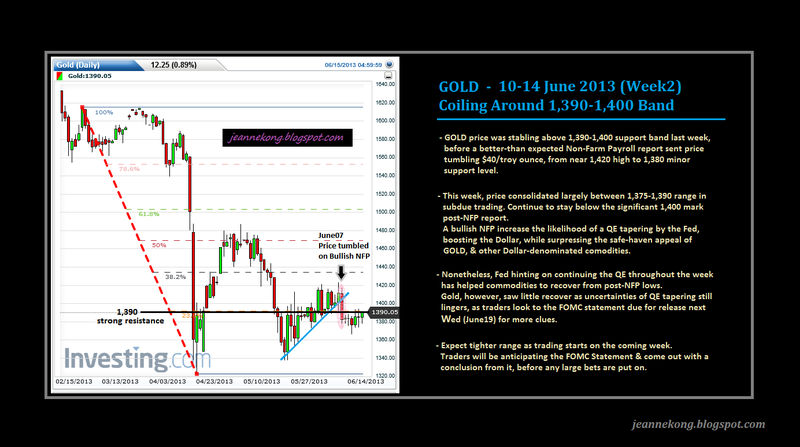 GOLD, tumbled after bullish Non-Farm Payroll report released on June07, hardly able to recoup the losses, stuck below 1,390 significant resistance level. Unless price regains its footing on 1,390-1,400 levels, near-term outlook remains weak towards 1,375-80 | 1,360-65 support band.